For creative work or research projects, the process is as important as the results, but the usual note-taking apps don’t support that – not because they’re not good, but because of their structure. You take notes, tag them, label them, and probably in the future, search for keywords in them to find the main note. That’s a system for storing and retrieving information, but not the way to see how things work and how the big picture looks like. Milanote gives you sort of a bulletin board, pretty much like what Google Keep does. However, unlike Google Keep, it doesn’t snap your stuff to a predetermined grid. You can stick your notes, boards, lists, and other stuff anywhere you want – even off the screen; yes, it expands indefinitely. 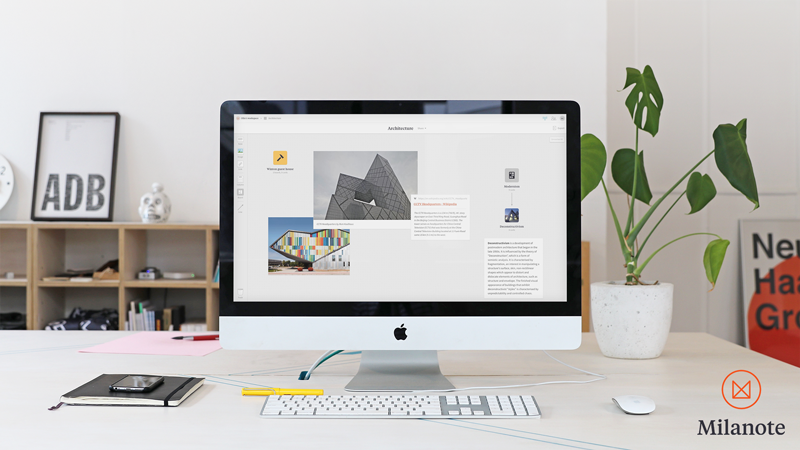 You can pin notes, images, and links to your boards. You can organise them [in columns] or leave them where they are. Feel free to be creative – or even make a mess. You are free. Another one of useful Milanote’s features is that you have the ability to export your boards. You can export them to PDF, Microsoft Word, Markdown, and Plain text documents. For PDF, you can have it as a list or the whole canvas. Although Milanote does not have any mobile app yet, they are on the list. So is Slack integration, which could be quite useful for creative teams. Currently, Milanote is in private beta and is set for a public release on February 7, 2017, but you can request early access here.